Up where we belong. Maybe some cats just need a bit of down time to recharge between events and don’t enjoy the overstimulation of a silent, empty house. This secluded spot seems perfect for Mr. Bowie to take a nap or even to sleep. I would love to have such a good, nice, safe and comfortable place. Mr Bowie looks so elegant no matter where he chooses to repose. I love the composition of your photo showing how he can survey his vast domain. I’d love a place like this, too. Would Mr. Bowie mind if I joined him? No problem. Feel free to join him. For those of us who love and care for our furriends well, they don’t know how good they have it. And it’s wonderful to be able to have a relationship with a happy cat. That’s a marvelous spot from which to observe activities of other creatures including of the human kind! He looks quite comfy up there and we ALL wish we had a special spot like that where we could totally – absolutely – RELAX (and eat dark chocolate). That does look like a pretty nice spot. Nice to meet you mate! Thank you piggies, that’s enough. Thank you for visiting our blog, it’s much appreciated by all of us even me, the hooman! … like we need dark chocolate! Wonder if Mr.Bowie would like some company up there? MY, He looks so REGAL! *(purrs)*! Mr. Bowie does seem quite content. Wish we had an outdoor space and not just our sunporch. If certain grey fools here didn’t try to climb the fence all the time we would get to go out in the yard way more than we do…..just saying…. So…you and Bowie enjoy sleeping on rocks? Ummm, OK.
See any eagles up there Mr Bowie? Papa must certainly be a gentleman with his new wheels, well until he hits the open highway….then it’s probably every man, eagle and vrouw for themselves, LOL. BTW, your landscaping is so cool. Thank you, Boomdee. The garden is looking really beautiful in May (and June). No eagles in this part of the world, B, but we got buzzards. Is that okay for you? Not the same cache really is it? Ha! 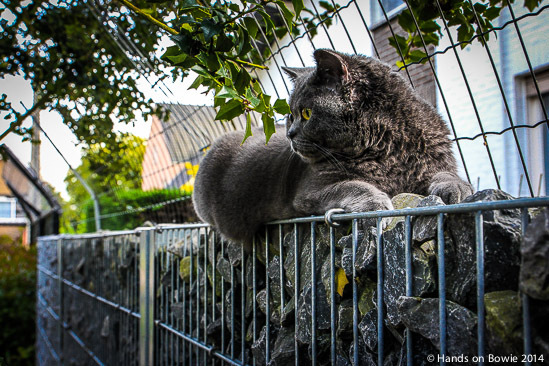 Was it your choice to cat-proof your property or is it required by law? It’s a great choice. I only asked because there is some debate here about cat control http://www.stuff.co.nz/national/9865248/Gareth-Morgan-Cats-need-microchips-and-curfew I don’t know what the outcome will be but microchips would be a good start. Thank you for your comment. Much appreciated! Mr bowie looks quite comfortable. Mr B is elegantly matched with his surroundings ! Well, Mr. B is a cat of the world! Cats do adore high places. I believe they like looking down on mere mortals below. We lived in a penthouse 16 foors up,. On day my neighbor told my cat had popped in for a visit. He had been out on the balcony catching the sun when he decided to walk along the edge of the building and through my neighbor’s open balcony door. Yikes. We put an end to that!. Oh boy… what a scary story! I wouldn’t go outside on a balcony 16 floors up… But I don’t know about Mr. Bowie!